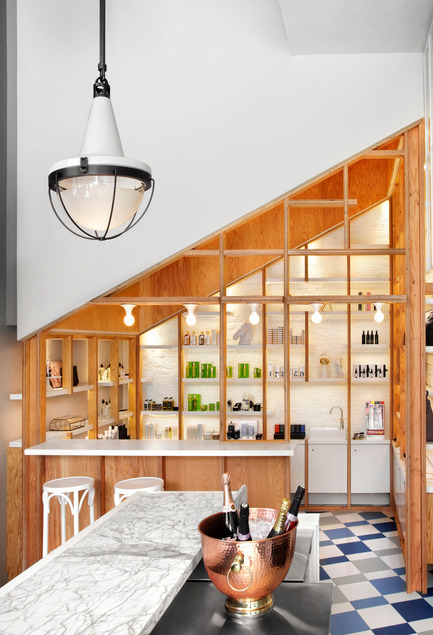 Toronto design firm +tongtong’s latest project, Her Majesty’s Pleasure, is equal parts café, retail boutique, beauty salon and bar, all located under one roof in downtown Toronto. 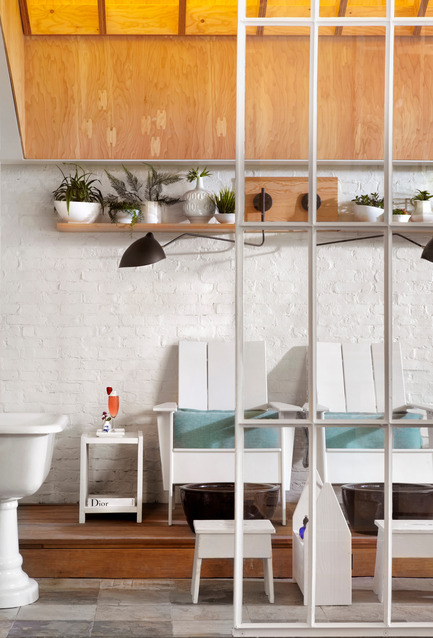 From the beginning, the +tongtong team, under the creative direction of John Tong, engaged in a meaningful dialogue with their clients Sara Kardan and Jeff Armstrong that continually challenged the conventions of the beauty salon experience. This collaborative relationship evolved the business model and was fundamental in developing the dynamic offerings of Her Majesty’s Pleasure. 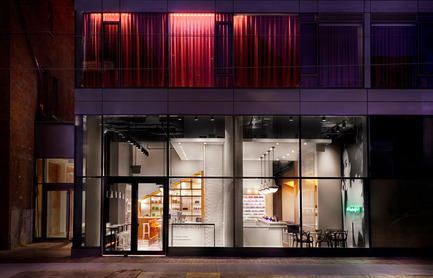 Situated at the base of a newly occupied condominium building on King Street West, the epicenter of where urbanites live, work and play, Her Majesty’s Pleasure is a place for women and men to get manicures, pedicures, and blowouts while socializing and sipping on their elixir of choice – freshly-squeezed juice, lattes or craft cocktails. 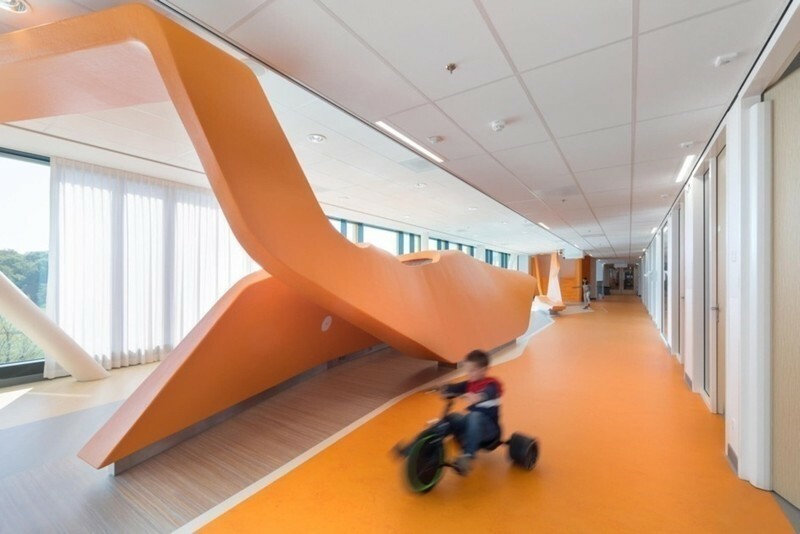 Architecturally, the space seamlessly reflects this multi-purpose program, blurring the lines between each zone. 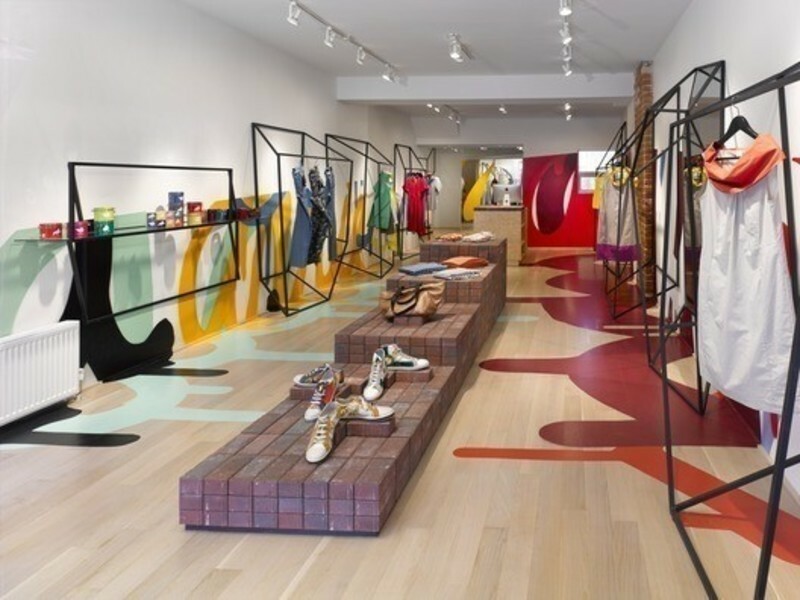 By reiterating materials, patterns and concepts across each area, Her Majesty’s Pleasure feels cohesive and connected throughout the space. 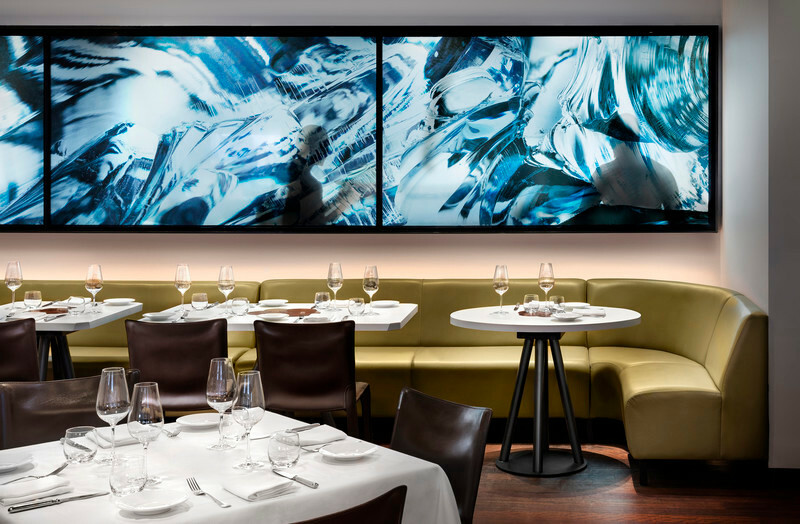 Overall, the firm kept the palette light and fresh, selecting white, light grey, charcoal, and varying shades of blue for the main colour scheme. 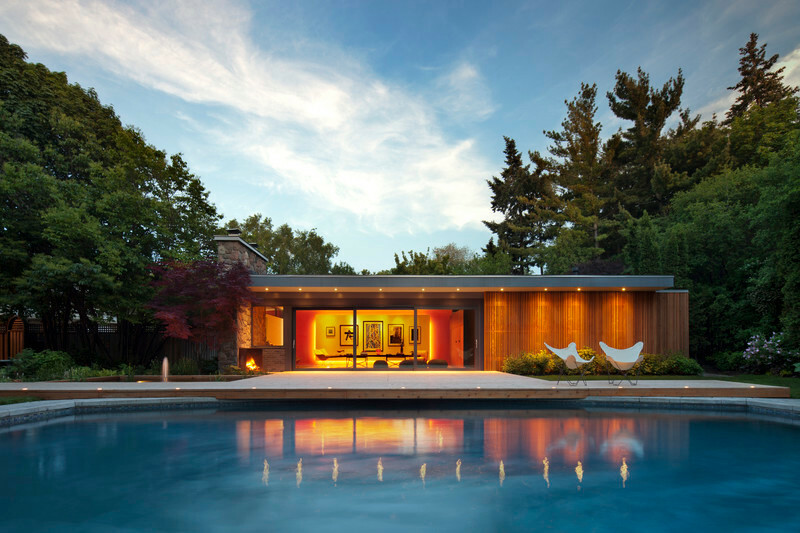 Hits of copper, bright yellow, Douglas fir plywood and slate added warmth and highlighted the palette. 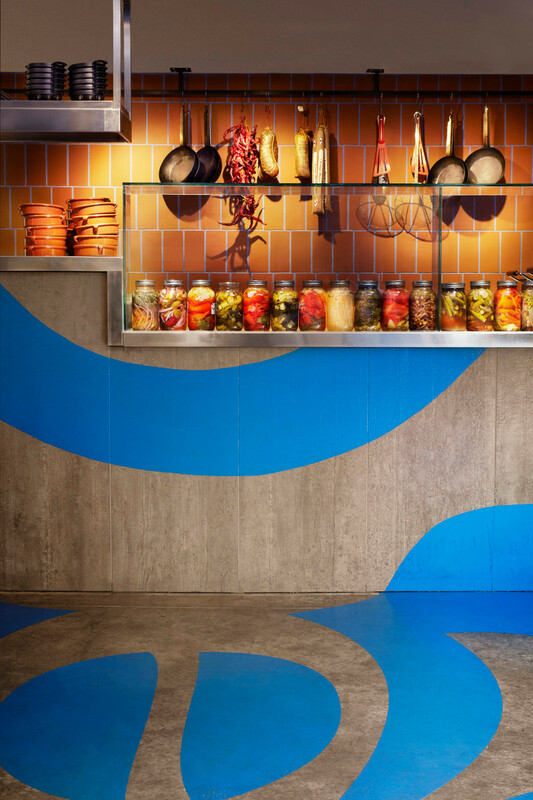 A bold custom-design graphic floor pattern of blues and grey tile energize the entry café/bar. “We aimed to bridge a sense of casual elegance and refinement with that of a more natural, tactile and edgy environment”, says Tong. 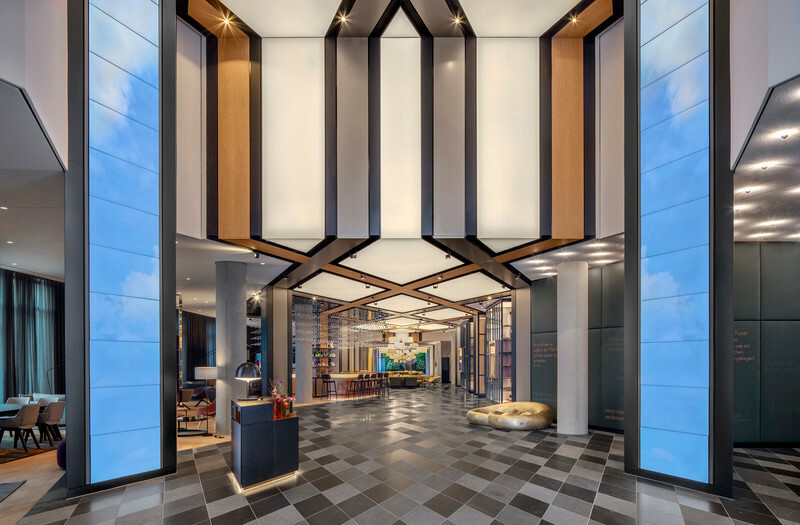 The scheme creates spaces that are both comfortable and inviting, while also addressing the design and fashion-forward culture of the neighbourhood. Her Majesty’s Pleasure opens with the café/bar area. 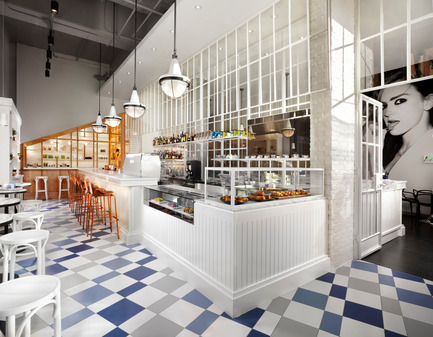 The one side of the room consists of a seemingly ornate, yet stripped down, whitewashed bar topped with white marble. 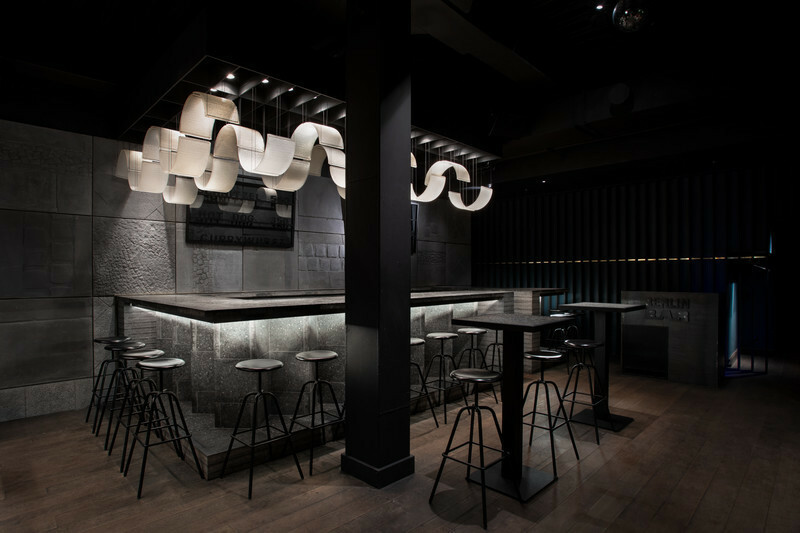 A line of geometrically folded copper stools reflect the coved lights under the bar, while across the room, bistro tables and custom-designed grey leather banquet seating with a geometric black steel base and Douglas fir foot rest line the wall. Riffing on the character of the bar, the sideboard features a white tile design with flecks of copper that resemble falling leaves. 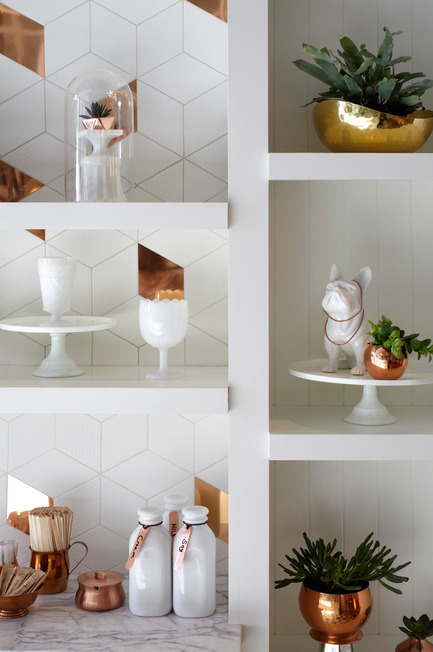 “Copper is a really warm tactile material and is the perfect foil to the whitewashed accents. It gives a bit of sparkle. It’s a precious metal that’s still industrial and elemental,” says Tong. 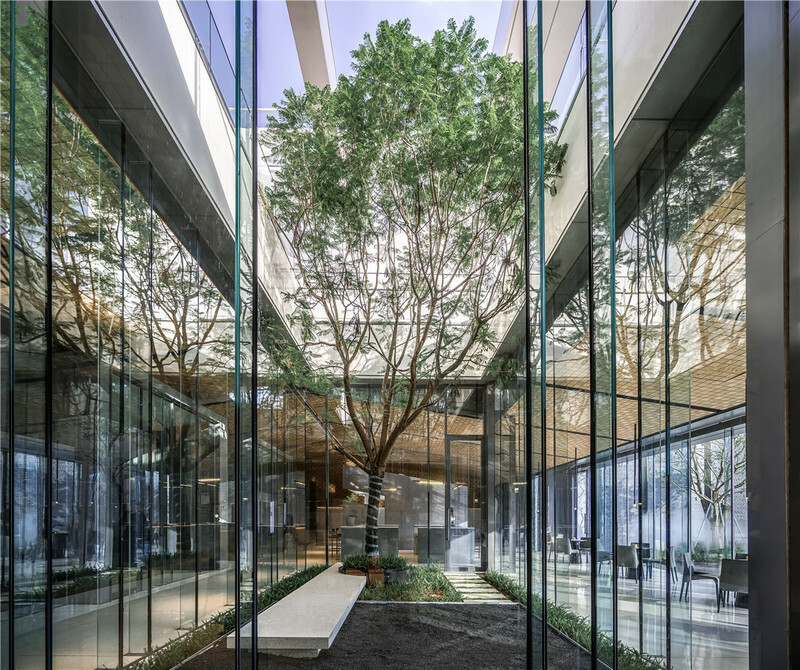 +tongtong accentuated the towering 20-foot-high ceilings by installing industrial, multi-pane glass and steel window frames behind the bar, a treatment that plays with the space’s proportions and also allows patrons to view into the salon area from the bar. 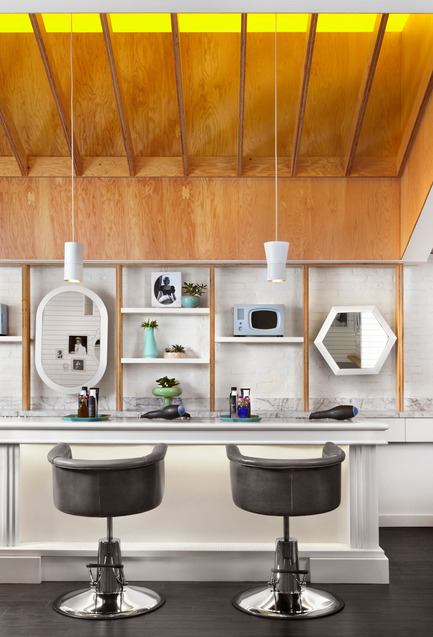 The bar and the salon are mirror images of the other, with identical white enameled steel pendant lights hanging in parallel, like voluptuous earrings complimenting a simple dress. 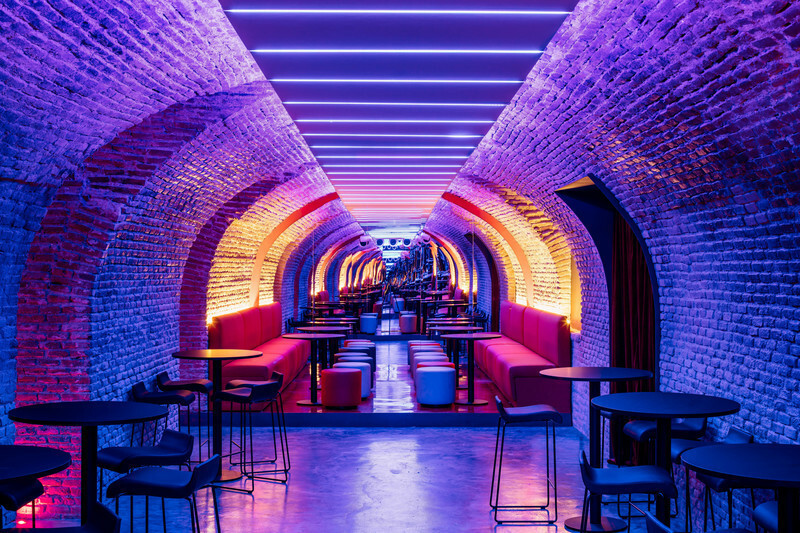 Immediately upon entering Her Majesty’s Pleasure, the eye is drawn to the architectural structure at the back of the space. 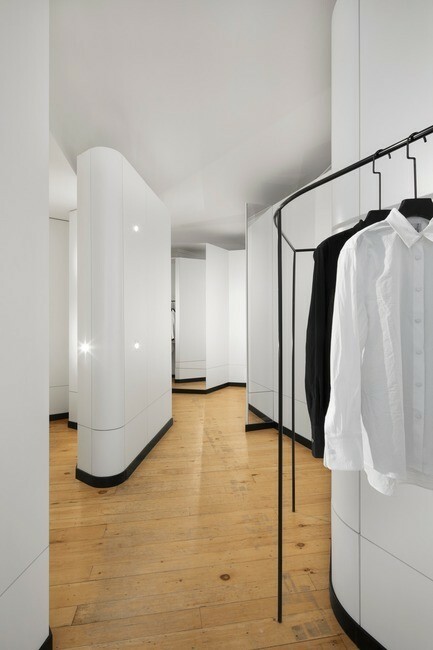 Serving double duty as a pop-up retail boutique and reception to the salon, the monolith is “a product display system grown out of an architectural construction,” says Tong. “It’s a structure within a structure.” The pitched roof language is another nod to tradition, resembling barns and tree houses alike, but the geometric wooden shelving, backlit by LEDs, is fully modern. Traveling past the wooden pop up, you arrive in the beauty salon. 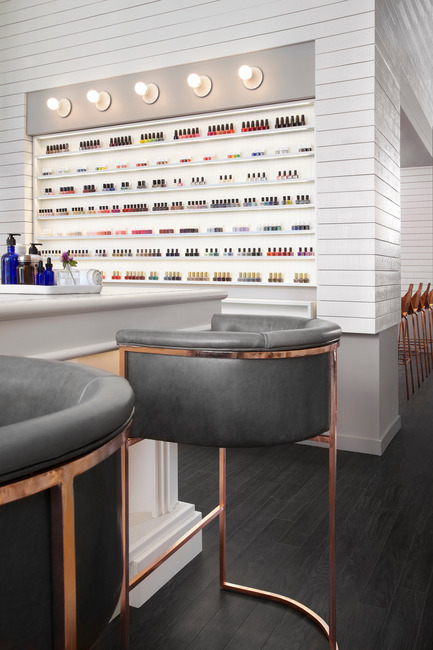 The marble bar from the entry wraps around, extending the experience into the salon and setting the stage for manicures. A long, raised wooden deck lined with Muskoka chairs defines the pedicure area. Above the deck, the coved ceiling is painted a fresh yellow and softly lit with a rafter-like structure assembled over top. 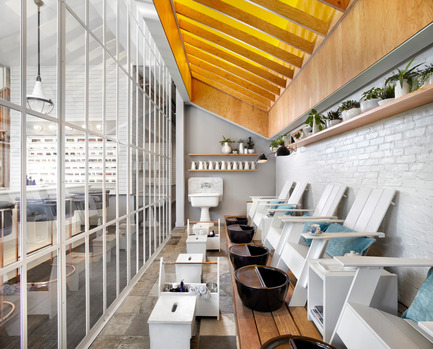 Like the retail boutique, the pedicure area, which was designed with an outdoor porch in mind, feels separate of the main area. 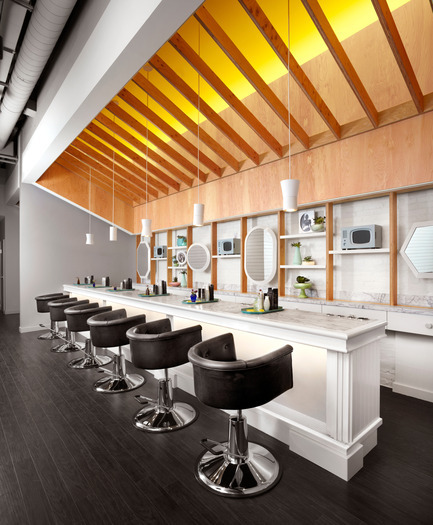 The blowout lounge also eschews the typical salon set-up. Patrons sit at the marble bar as they get their hair done, with bartenders serving on the other side. Located across the aisle, the makeup lounge – which can be used to collect oneself after a treatment or booked for private functions – is articulated from the rest of the space as a wood cabin. 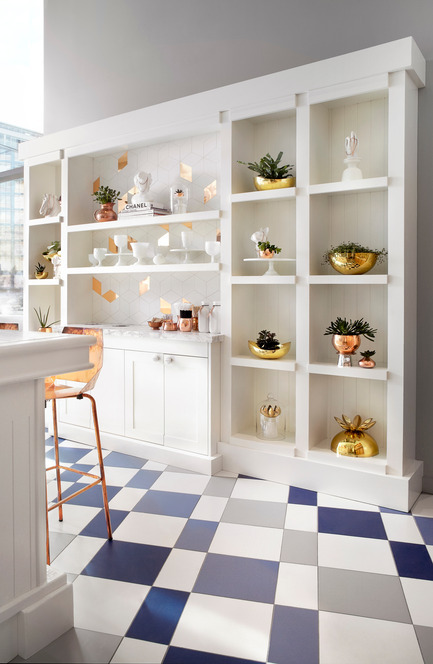 At the center of the lounge, geometric copper stools surround a custom-designed table, which is topped with copper and white diamond-shaped tiles. John Tong (B. 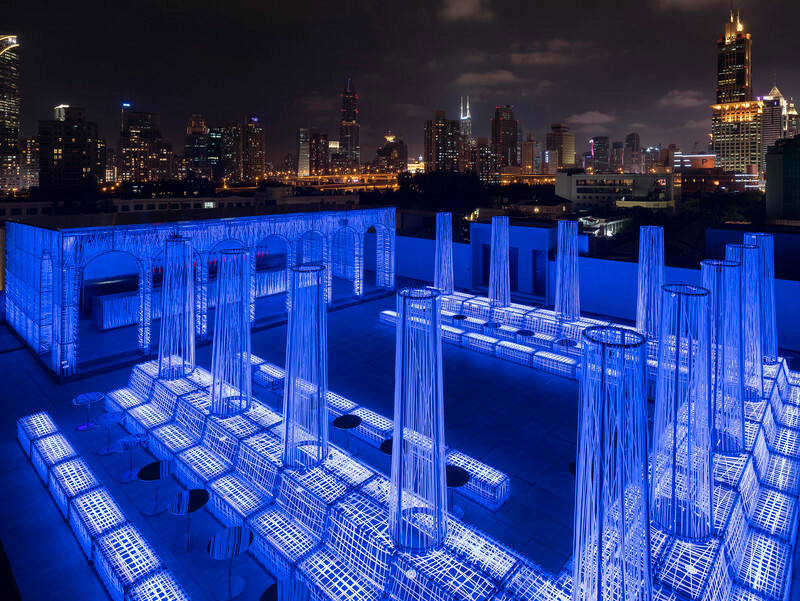 Architecture from the University of Toronto, 1992) is the founding principal and creative director of +tongtong. 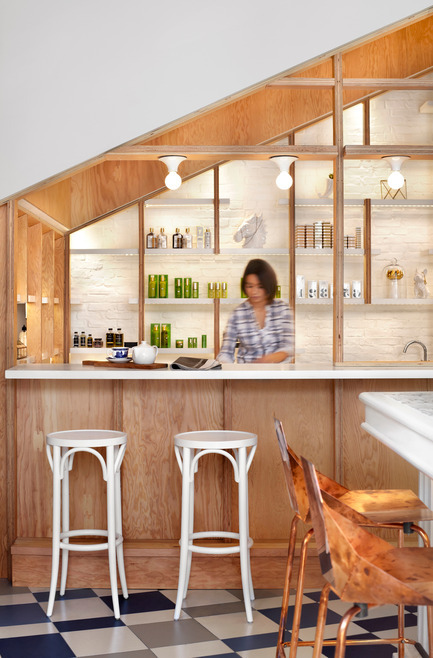 The firm has recently completed the Drake Devonshire Inn in Prince Edward County (Tong was also lead designer for the Drake Hotel in Toronto) just 2 hours from Toronto. 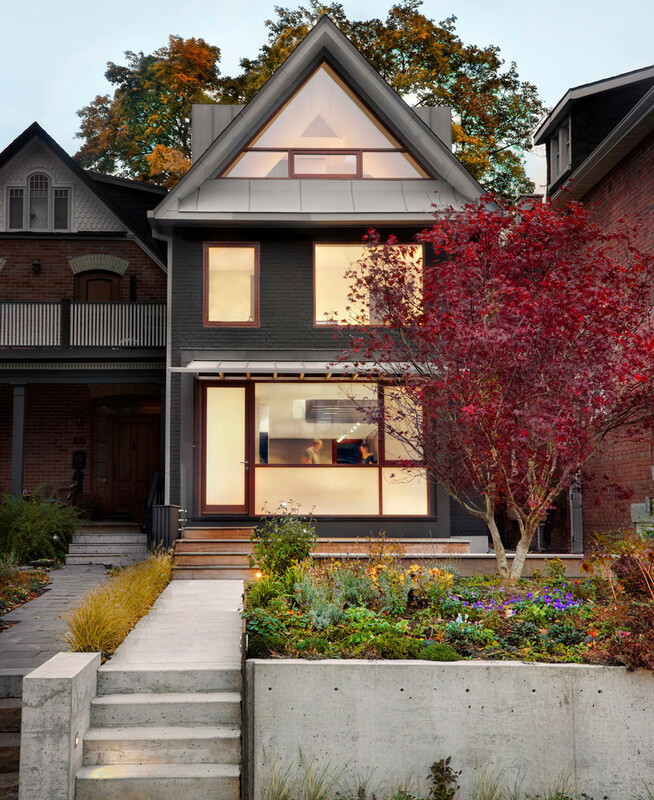 Ongoing projects include commercial and custom residential projects across Canada and the United States. 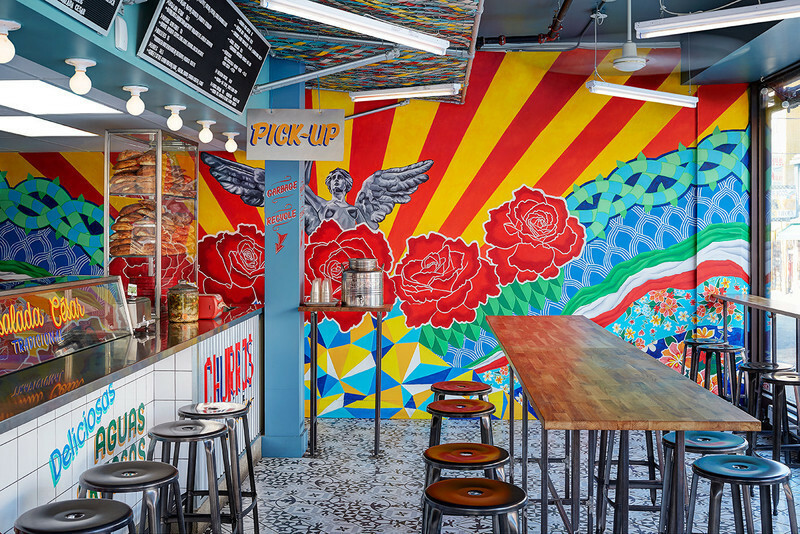 +tongtong recently designed a Spanish-influenced tapas restaurant Barsa Taberna, the boutiques Black Toe Running and Annie Aime, all located in downtown Toronto. 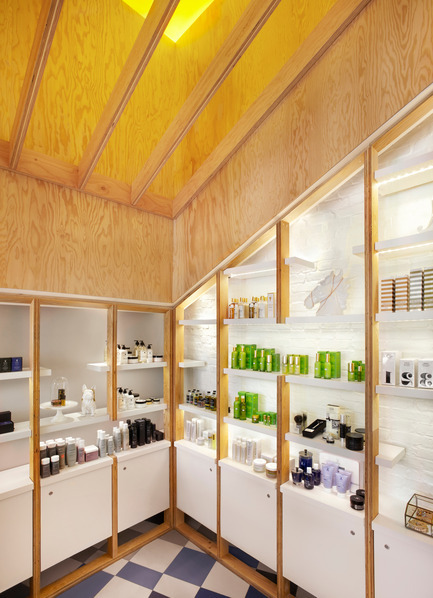 Serving double duty as a pop-up retail boutique and reception to the salon, the monolith is “a product display system grown out of an architectural construction,” says Tong. “It’s a structure within a structure.” The pitched roof language is another nod to tradition, resembling barns and tree houses alike, but the geometric wooden shelving, backlit by LEDs, is fully modern. A long, raised wooden deck lined with Muskoka chairs defines the pedicure area. Above the deck, the coved ceiling is painted a fresh yellow and softly lit with a rafter-like structure assembled over top. The pedicure area, which was designed with an outdoor porch in mind, feels separate of the main area. A long, raised wooden deck lined with Muskoka chairs defines the pedicure area. Patrons sit at the marble bar as they get their hair done, with bartenders serving on the other side. 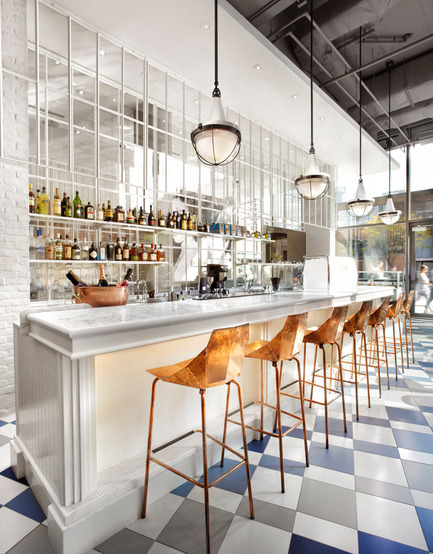 The one side of the room consists of a seemingly ornate, yet stripped down, whitewashed bar topped with white marble. 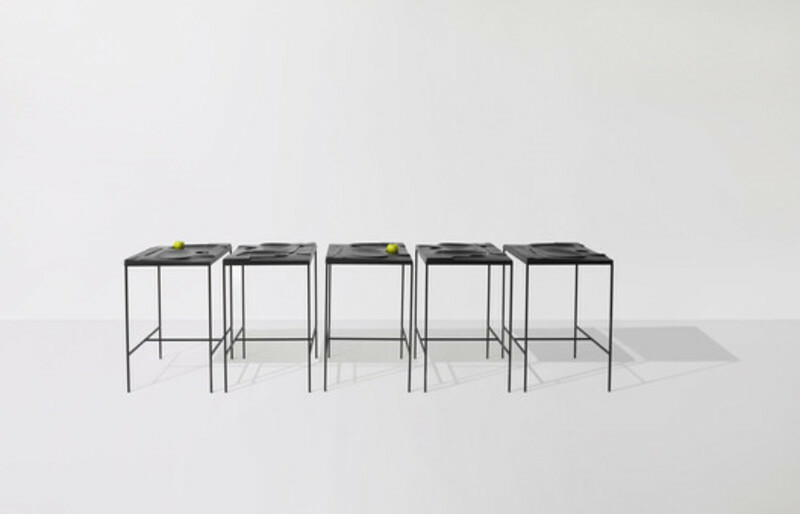 A line of geometrically folded copper stools reflect the coved lights under the bar. Riffing on the character of the bar, the sideboard features a white tile design with flecks of copper that resemble falling leaves. 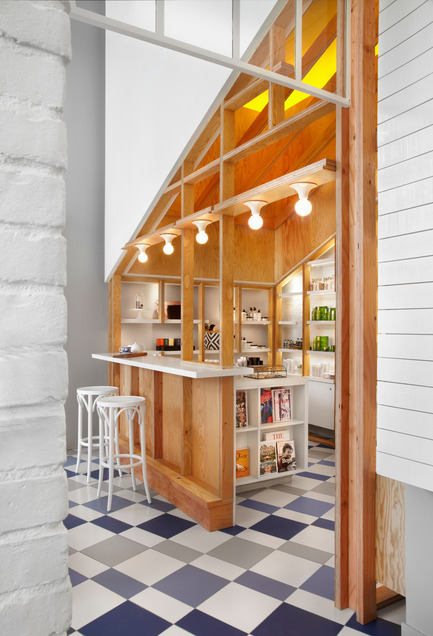 The lively juxtaposition of the natural wood and the whitewash was a way to really bring a modern architectural, slightly edgier language to something more traditional and refined yet playful. 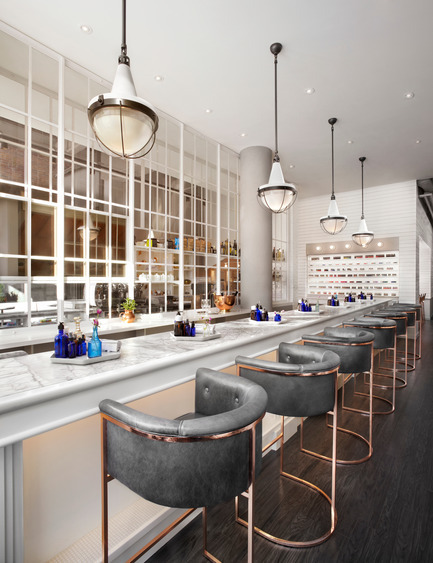 The marble bar from the entry wraps around, extending the experience into the salon and setting the stage for manicures. 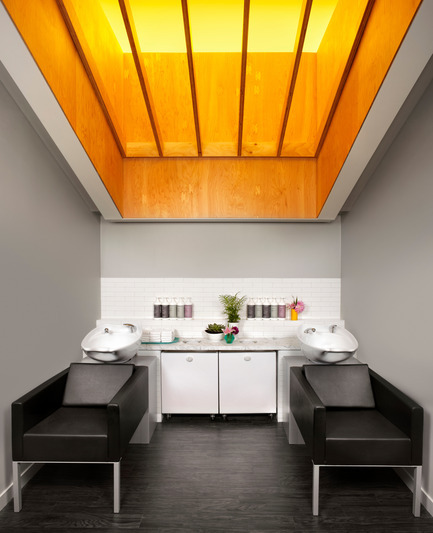 The makeup lounge – which can be used to collect oneself after a treatment or booked for private functions – is articulated from the rest of the space as a wood cabin. The coved ceiling is painted a fresh yellow and softly lit with a rafter-like structure assembled over top.